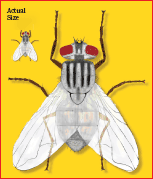 Adult Horn Flies are slender, 3/16” long and are about 1/2 the size of a typical House Fly. They are charcoal gray in color, with 2 dark stripes on the thorax, and a few diffuse spots on the top of the abdomen. They have an extended, piercing proboscis and long palps. Horn Flies congregate on the back, and if hot or raining, on the belly. The feeding of large numbers, as shown above, can cause lower weight gain and reduced milk production. Horn Fly adults typically occur on pastured cattle but they may also attack sheep, goats, horses, mules and dogs on any farm. The flies spend most of their life on the host animal, usually congregating on the back and shoulders. During very hot or rainy weather, the flies move to the underside of the belly. Both sexes bite intermittently and may feed up to 20-40 times per day. Large numbers of flies (more than 200 per animal) cause lower weight gains and milk yields. Animals become so annoyed that they may injure themselves while attempting to dislodge the flies. They seldom bite people. Similar to Stable Flies, Horn Flies have a stiff, piercing mouthpart that projects out in front of the head. Consult your local Veterinarian or farm extension agent for effective control methods in your area. Females require blood meals for egg production and can lay several hundred eggs during their lifespan. They leave the host briefly to lay eggs on very fresh, undisturbed manure of cattle grazing on forages. Manure from feedlot cattle fed on silage/grain is much less suitable. Hence, Horn Flies (Face Flies too) are more a pest of pastured cattle, but they can move to confined animals if the pastured cows are moved close in. The larvae are small yellowish-white maggots. They complete their development in the pat within 1-2 weeks. The entire life cycle is completed within 2-4 weeks. Horn Flies overwinter as puparia (in the cocoon) beneath cow pats and emerge the next spring as adults. Fly Predators will help control Horn Flies but the Fly Predators have to be distributed in the pastures where the undisturbed cow pats occur and at 1.5x the normal application rate per animal. These small (1/4” long), non-biting flies are greyish-brown in color with 4 dark stripes on the thorax and a grey-black patterned abdomen. In the female, the abdomen has little yellow or orange on the sides but, in the male, the sides of are yellowish-orange to orange-brown. The eyes of the female are surrounded by a silvery stripe; the male’s eyes almost touch in the center. The mouthparts of the Face Fly are fleshy and blunt and do not protrude straight from the head like a bayonet, as do those of the Horn Fly and Stable Fly. Face Flies superficially look like House Flies but they lay their eggs only on fresh cattle manure in fields. The life cycle takes about 2 weeks. The larvae develop within the dung and pupate in the surrounding soil. Unlike the House Fly, Face Flies are pests of cattle in pastures during the warm months. The adult female flies tend to feed on secretions from the eyes, nostrils, and mouths of pastured cattle, causing extreme annoyance and allowing for the transmission of pinkeye and other eye diseases. By contrast, male Face Flies feed only on nectar and manure. They spend much of their time resting on branches and fences and attempting to catch and copulate with female flies as they move about. Face Flies are strong, robust fliers that can travel several miles. 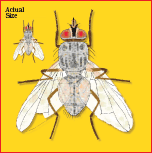 Unlike House Flies, Face Flies do not enter darkened barns or stables during the summer months. So providing a shady area for animals during the day can provide some relief. However, in the fall, they will enter farm homes and other buildings and overwinter indoors near pastures or where cattle are kept. During warmer days in the early spring, some Face Flies may come out of their hiding places in the attic and walls and appear on south-facing windows. windows.